New York Fashion Week inspired us with the endless creative visions from designers that came to life on the runways. 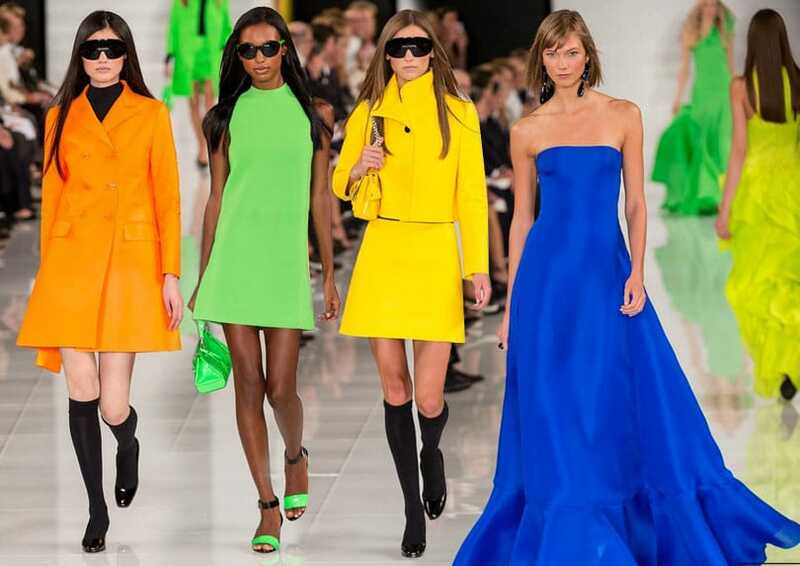 Some of our favourites and quite arguably the highlights of the spring/summer 2014 shows were Ralph Lauren, Carolina Herrera, Lacoste, DKNY and Michael Kors. 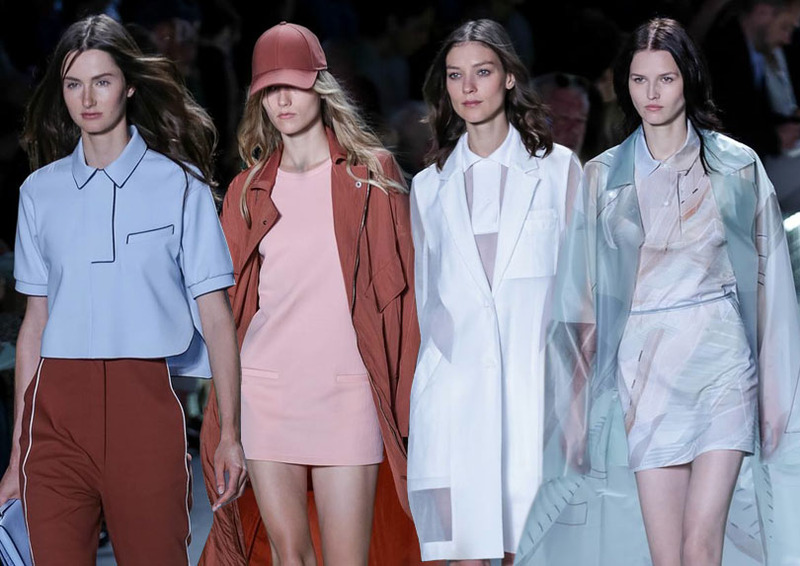 DKNY has brought its quirky designs to the runways of New York Fashion Week, displaying clothing that is comfortable, youthful and fun. The downtown garage space set the scene for what was to come, the journey began in New York, what better place to set the attitude for the collection that has stayed true to its urban mind-set and marked the label’s 25th anniversary. Revisiting some of the brands key pieces or street-wear staples, DKNY showed they are all about simplicity and precision, but they’re also not afraid to have fun doing it. The label has never been concerned with sculptured silhouettes; instead, it focuses on lifestyles. This one happens to be the pizza side dish to Donna Karan’s gourmet meal, but we love it for the sportswear meets hip-hop inspiration! 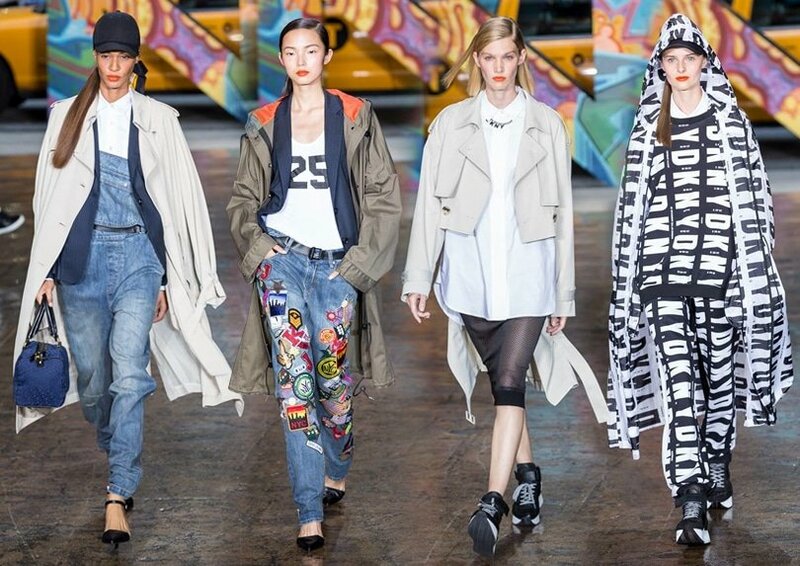 The clash of bold colours, baggy tapered jeans plastered with the funky DKNY logos, button-ups and blazers, sportswear inspired track pants, parkas, trench coats, baseball caps and wedge sneakers that blurred the lines between femininity and masculinity. However, the collection did transition to include designs that spoke to the girly girl, as pastel-coloured tailoring made its appearance, bodysuits and fitted low-backed dresses, sheer dungaree dresses and slit skirts graced the runway. There was even a little surprise, as Rita Ora, the current face of the quirky brand, ended the show skipping down the runway to “(You Gotta) Fight for Your Right (To Party).” Perfectly summing up just what DKNY is all about, fun and youth! Ralph Lauren embraced modernity for spring, starting with collections that exuded simple elegance in black and white. Showing looks that are perfect for looking feminine and stylish in the corporate world, with elegant three-piece pantsuits, tuxedo-inspired suits, floral trench coats, myriad trousers, low-slung mini-skirts, Tattersall checkered collar shirts, floral ties and several striped and neutral shift dresses. The accessories were kept simple, patent leather and oversized patterned clutches, futuristic inspired goggles and classy totes. Ralph Lauren showed off dramatic yet romantic collections and embraced the swinging sixties with simple A-line shift dresses, knee length socks and patent leather Mary-Janes. While more than half the collection concentrated on black and whites, when colour entered the runways, it did so by demanding attention in Crayola brights. The hues of neon orange, lime green, reds and yellows and finally deep cobalt blue are not for those who want to blend into the scenery this spring. However, the designs were luxuriously feminine, evening dresses with Chantilly lace, strapless gazar gowns, shift dresses with dipped hems, several cape style dresses and beautiful button-downed jackets paired with mini -skirts. The vivid colours of the collection send the resounding note that spring is coming! When Michael Kors gets it right, he is unbeaten! His collection perfectly understood what a “real” woman wants to wear, and she will feel comfortable and confident wearing it. 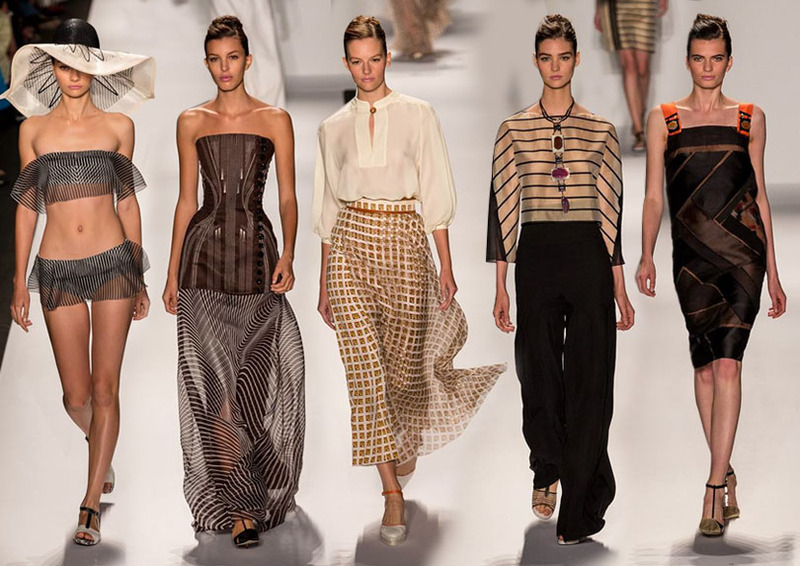 This beautiful collection was soft and romantic, yet showcased Kors superb tailoring. Collections of button-downs, pleated dresses, structured blazers, full trousers, perfectly tailored khaki shorts and flaring midi skirts echoed an almost retro feel. We salute Kors for his unbelievably long and light coats, reinforcing the belief that outerwear can not only add to an outfit but make it. The simplicity and ease of the designs ensured that the entire collection was wearable and transitioned between night and day. Kors was onto something with his colour pallet, a collection of rich earthy tones including khaki, browns, tans, lawn greens, navy, flashes of whites and green prints, which made us wish we were on a safari, or at the very least left in anticipation for spring. However, rather unusually, this collection appeared to be well equipped for the cold weather (not spring, like we were expecting) sable shrugs, structured blazers, trench coats, fox shawls and mohair cardigans competed for attention with the breezy linen collections. Regardless, Michael Kors has to be an all American favourite for this season. The Carolina Herrera collection was classy and feminine, with French inspired updos, the models sported a collection of beautifully designed dresses: the classic sleek silhouette, boxy frocks and embellished tulle pieces. The Herrera collection was devoted to eveningwear, with very few trousers being shown. Rather it was a series of soft and easy dresses, several glamorous and full length, flowing gowns in various geo-prints and colours: chocolate, citrus, jade and aubergine hues, and provided an interesting contrast with whites and creams. It was not all just feminine silhouettes and spring colours because these billowing gowns and skirts appeared in mesh-like tulle with organza overlays to ensure that there was a movement for new SS14 collection. The collection produced an eye-catching effect, as the models gracefully walked down the catwalk; the layered lines came to life to produce an optical illusion. Also, her collections embraced the spring season, showing off a black and white bikini covered with wafting organza and paired with a beautiful floppy hat. Lacoste stayed true to its preppy and sportive roots, presenting a collection with a creative on tennis. Felipe Oliveira Baptista toyed with imagery of the tennis court, recreating the boundary lines by using piped edging on polo shorts, trompe l’oeil in futuristic linear patterns and creating an almost two-dimensional effect on suits for both men and women. “Even in tennis, you have to play within the rules, inside the lines. On the other hand, it is good to break them.” – Felipe Oliveira Baptista. Baptista’s took the original sportswear inspired legacy and added a futuristic element to his new collection, combining sheer on sheer and sheer inserts, and the collection showed exactly why Baptista deserves to be the creative manager of Lacoste. Minimalism reigned with the simple but tailored designs of renewed classic tennis dresses, adapted with side pleats and a dropped waist. Cotton polo shirts were reconfigured with white piping, sheer panelled shirts, dresses and trousers appeared with side detail, classic blazers and trench coats were restructured in an interesting colour pallet.